The most common reason to look for an alteration service is to have hems and sleeves adjusted on skirts, dresses, jeans, slacks, shirts, blouse, and blazers. 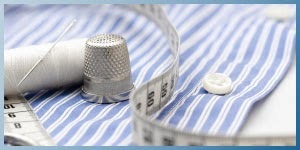 Take advantage of our expert tailoring and alteration services to help maintain the look of your garments. We repair tears and snags, and replace zippers and buttons so you can get more life out of your garments. Bring your personal style to any garment with our custom fittings, so that your clothes fit you exactly the way you like. For the ultimate convenience, try our new Style Service and have our tailors cater to you at home or at your place of business. Our deconstructive & reconstructive service is the epitome of excellence in fine garment care. Trained specialists carefully take your garment apart, stitch by stitch, and then clean each individual piece separately before restoring the item to its original pristine condition. Similarly, fine handbags may be made of several different elements that cannot be cleaned using a single method without damaging the overall piece. This makes it impossible to use traditional cleaning processes. Style by Dependable experts recognize the complexity of such items and take the extra time to maintain your fashion investment. Our skilled tailors can reweave and repair holes, whether they were caused by snags, moths or rips, so you’ll never have to lose a favorite piece of your wardrobe.